Christopher came out to the world with a bang at age 16 in September, 1988. He moved to Halifax from Dartmouth shortly thereafter. He didn't want to continue with school at that time, so he joined a government program for youth called YES Canada. It was designed to prepare young people for the workforce. Of course, he was top of his class and very proud of his certificate when he received it. In 1990 or 91 he got the phone call from one of his friends to go get his blood checked. Unfortunately, those tests came back positive. HIV had found another person in our community. He handled it in his usual manner, taking it in stride and never let it hold him back or define him in any way. Some "meds" he handled well. Others well not so much. He kept his spirits up and kept moving forward. "Stop mothering me," became a frequent comment when one overstepped and he was feeling off. He was the biggest Star Wars lover in the world and collected so many pieces all through his life. When in doubt about a gift as long as it was Star Wars themed you knew he'd love it. He loved to read; Stephen King, V.C. Andrews were his favourites though he'd read almost anything and always had a book, or two, on the go. He also was good at gymnastics and could still do cartwheels, at a friends wedding, a few months before he left us. He loved to walk Halifax and Dartmouth and knew both cities inside out. You could not go wrong by saying, "Let's go to The Gardens or Point Pleasant Park." Shakespeare in the Park became an addiction and looked forward to every year. Midsummer's Nights Dream and the Tempest were his fav's. He loved the theatre. Plays, concerts, it didn't matter he just loved to go and experience it. In the 90's he got involved with Tightrope, a leather, and denim group. The friends he made through this group were his friends for the rest of his life even after the group disbanded, 2007. Seldom would he miss an outing or gathering if there was any way for him to attend. In 2000/2001 he came in 2nd place for MAC Leather, Halifax, and was MrLeatherNrg 2002, all achievement he cherished. He did a few Leather themed photo shoots at this time too so he was a model also. He got to be a background dancer in a production at Neptune Theatre in 2000. He loved to dance. he danced at home, on the street where ever there was a beat he had moves. Karaoke. Once he caught the bug he hated to miss it. He'd go to Menz and Molly's, The Lions Head anywhere he could get a mike in his hands. Rainbow Connection, Titanium, various show tunes these all come to mind as his favourites. In his last year, he and I spent hours with him and I singing to youtube videos the songs he wanted to do that week at the club. He volunteered time at the AidsCoalition, helped fundraise for Breast Cancer Research, SteppingStone, and the food banks. He loved to help how and when he could. He loved to travel too, Florida, Cuba, trips to Toronto and Montreal. He wanted so to go to Amsterdam. His love of animals was legendary. From Mitzi, his family dog growing up. His travels to Florida looking after the snakes in a traveling Serpentarium show. His cat Trash. Stopping to talk with the owners of dogs walking down the street. He wanted a dog of his own but knew his apartment was too small for a dog the size he really wanted. He needed, " A house with a white picket fence and room for a big dog", he was so close to getting it too. Finally, Liver Cancer took him from us. While waiting to have a procedure scheduled to remove a spot on his liver. The cancer suddenly became very malignant and he was gone in only a few days. I know I will be adding things to this as time goes on, but for now, this is all I can write. I miss my friend and my love. Country Mouse still loves his City Mouse. May the Force be with you all!! 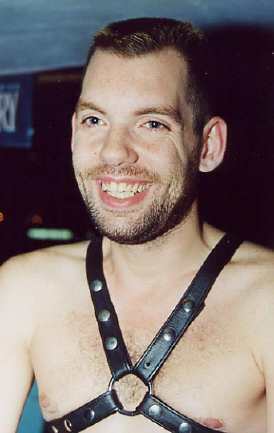 NatasshaNlott writes: Chris is one of my favourite leatherman performers. He worked hard to improve his performances constantly, had a good sense of humour about himself and was always friendly. Good qualities.